GUEST ARRIVAL: 5:30-6:30/ RUNWAY SHOW 6:30-8 / POST PARTY 8-11 p.m.
Join us at our annual “You Night Cancer Survivor Runway Show and Celebration” as 24 cancer survivors celebrate life beyond a cancer diagnosis. 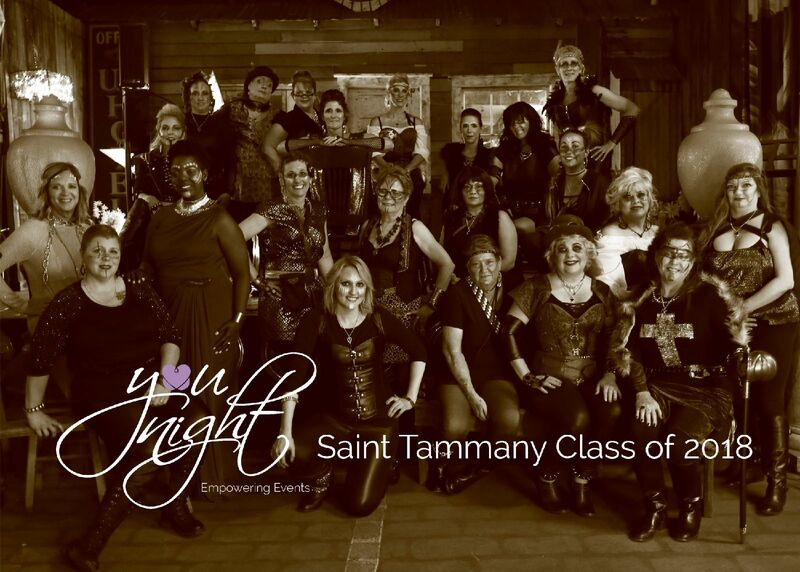 The You Night St. Tammany Class of 2018 is celebrating this year's theme, "FIERCE BEAUTY - Revolution". This is the tenth class to participate in this unique empowerment training program that addresses the emotional, physical and mental impacts of cancer, while building a sisterhood of support. Over 600 persons are expected at this exciting and emotionally uplifting event, where guests will be inspired by the strength of our survivors whose desire is to bring hope to others battling and overcoming the disease. You Night features a 72’ long state of the art runway stage, with incredible entertainment that will leave you smiling and inspired. Our courageous participants are not just models...they become role models for our communities. This event is open to the public! Men and women alike will thoroughly enjoy this celebration of life! To view the list of participants in this class, click here. YOUR TICKET INCLUDES THE RUNWAY SHOW, POST PARTY WITH MUSIC, HOSTED FOOD AND THE FOLLOWING BEVERAGES: Port Orleans Beer, Coca Cola products, White and Red Wine and a specialty cocktail. A Cash bar is available for mixed drinks. If you are requesting to be in a model’s seating section, please specify that when you place your order. “Friends and Family” and “General Admission” tickets are runway seating (not tables). with open bar and delicious food, and VIP seating at Pub Tables near the runway with cocktail table service. The VIP Pub Table Experience includes four passes to our designated VIP parking area, VIP check-in, VIP Experience Lounge with open bar and delicious food, and a reserved VIP Pub Table with your group’s name on a table sign near the runway with cocktail table service. Note: If you are purchasing the VIP experience and wish to have marketing perks for your organization, which includes reserved runway premium seating, signage, social media and a host of other year-round marketing opportunities, please contact Stephanie Rivers at 877-591-5936 x 2 or write to info@younightevents.com. You Night Legacy Partners receive a host of marketing benefits, which include year-round marketing opportunities for your organization. Packages start at $3000, and include your company’s name (and hyperlink to your own website) permanently on every page of our website, plus your name will appear in all marketing materials, signage, social media shout outs, plus other premium exposure options, depending on the level of sponsorship you select. Our Legacy Partners help make year-round programming possible. For information, contact: Stephanie Rivers at 877-591-5936 x 2 or write to info@younightevents.com. DRESS CODE: Arrive fashionably dressed! The theme is FIERCE if you feel like joining us in theme attire. OUR PROGRAM AND MISSION: We are a program developed to address the on-going needs of survivors. We create empowering group activities that result in a powerful sisterhood of support. We have recently launched our You Knight program to address the needs of the male care-givers, and have just launched “ScART” -- a national partnership with Painting with a Twist, where survivors paint their scars on canvas as abstract works of art. You Night was named "Most Glamorous Event" by St. Charles Avenue Magazine, and has been awarded the Small Business Administratives company of the year for Louisiana in the InnovateHer challenge, for companies whose mission is to help women in their communities. You Night was featured in a national Capital One commercial, viewed by over 3 million persons in social media. Empower One, Impact Many! We look forward to welcoming you to this celebration as our role models show everyone that life can be " fiercely" lived!